HPPSC Assistant Professor Govt Jobs Recruitment Notification: Himachal Pradesh Public Service Commission has been released notification to recruit the Associate Professor, Medical Officer, HPFS of Himachal Pradesh Public Service in various government departments of Himachal Pradesh through the general recruitment of HPPSC Competitive Examination. There are total 298 vacancies available in this HPPSC recruitment. Eligible candidates are suggested to apply online on or before 31-07-2017 through online using official website of PSC of Himachal Pradesh @www.hppsc.hp.gov.in. 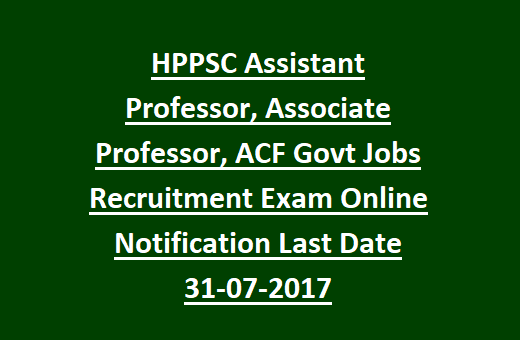 This Assistant Professor and HPFS recruitment of HPPSC will have screening test/written exam/interview/personality test. See the below given details for available vacancies, age limits, educational qualification, and application process for HPPSC Professor, Assistant Professor and HPFS general recruitment examination notification. The candidate who are interested and competent to apply for HPPSC Jobs, on must have Diploma/PG Diploma/Engineering Degree/Graduation Degree/Post Graduation Degree or shall have a equivalent from a recognized Board or University. Department of Medical education: 03. Department of Health and Family welfare: 26. Department of Higher education: 204. Department of Social justice and empowerment: 08. Department of Technical, Education, Vocational and Industrial training: 43. Department of Information and Public relations: 02. Department of Town and Country planning: 01. As per the guidelines of Himachal Pradesh Public Service Commission the candidates should have their age between 18-45 years. However, age relaxations are applicable as for reservations. Age criteria differ from department to department. The candidates who are interested to apply for HPPSC Jobs have to pay application fee of Rs. 100 for reserved candidates and only Rs. 400 for remaining candidates. There is no fee for Ex-Serviceman. There is different pay scale for each job in HPPSC recruitment. For clear information about payment details go through official notification. The candidates with eligibility and proper educational qualification will have to go through screening test/written exam/interview/personality exam. The interested and competent candidates can apply for the jobs of Associate Professor, Medical Officer and HPSF through online. Fill the application and send it before 31-07-2017. For further information and more details about the posts of HPPSC Associate Professor, Medical Officer and HPSF jobs view the official notification.